I’m feeling the energy of the Virgo New Moon having just finished up the free New Moon in Virgo Teleclass & Meditation… just minutes ago. I’m so grateful to each and every one of you who took time out of your busy schedule to join me this evening. It being a Saturday, I almost expected no one to show up. But you did and I’m delighted! It was a remarkable meeting of minds and hearts – and a true melding! Now I want to share our gorgeous meditation with all of you! In creating this meditation I focused on the energies of the New Moon and Sun in Virgo as they emphasize and engage you in being complete unto yourself – the true meaning of the word “Virgin.” Virgin, in its original definition, means a woman unto herself. At the moment of the New Moon, intended to restore your soul, the Sun and Moon are involved in a conjunction aspect to Mercury. That simply means that these bodies are sharing exactly the same spot in the sky. This is a connection of working in tandem – of close association – of a new beginning between your core creative Self symbolized by the Sun, your emotional Self symbolized by the Moon, and quickened thought processes and need for communication symbolized by Mercury. This connection highlights a need to express to others your emotions and your heart’s desires in a way that is practical, discriminating and that leads to finding the Self through service. Allow this meditation to refresh, restore and regenerate your spirit as you prepare for a new creative beginning in the next few days. A new cycle of creation begins today. Below you may listen to the meditation or read it for yourself. Now, breathing slowly and fully in and out, imagine that you are in a beautifully farmed field. Crops have been planted in perfect rows and beds, perfectly following the graceful rise and fall of the gentle hills. The varieties of ripe and heavy vegetables with their vibrant reds, yellow, oranges and purples and huge, luscious clusters of greens seem almost endless, growing with strength and perfect health from the rich, black, damp earth toward the gorgeous yellow sun on one side – and covered with dew and loud with the sound of insects wings under a black night sky on the other. You are standing in the fields, in the crux between the Sun and New Moon, of the Virgin. The air around you is crisp and delightful – clean and pure. It vibrates with every hue, tangible and alive. The time of harvest has clearly arrived and there is a sense of expectancy. Breathing slowly and deeply, turn toward the night side of the field. You begin to feel that there are others present. It is completely dark at the farthest reaches of the field, but you can feel their presence and slowly begin to hear rustlings as they seem to begin to move toward you. Now you turn in the other direction, toward the glorious color of the ripened fields and sun and you see a woman walking purposefully, gracefully, toward you. As she gets closer, you see how fully awake, how vibrant, and how joyful she is! She is glowing with health, radiating love, and her eyes are alive with intelligence. Her clothes are all the colors of the fields and she carries a large woven basket. Then you realize that there is a glowing, ethereal light around her head. You suddenly realize that here is the Goddess of the Harvest, Virgo the Virgin herself, and it is because of her that this bounty is before you. She catches and captures your eyes, and then very slightly nods to a place behind you. You turn to see the others that you sensed before, now walking toward the two of you, coming steadily from the darkness into the light. There are women, men and children. There are animals of every kind. There are birds and insects and frogs and creatures you don’t recognize. And as they come slowly forward, you realize that each of them is either hungry or in need in some way. They are the faces of all humanity, diverse in appearance, but the same in their need. As you take in the state of these fellow beings, your heart is touched with compassion and your mind begins to race with the need to help, to restore all of them. 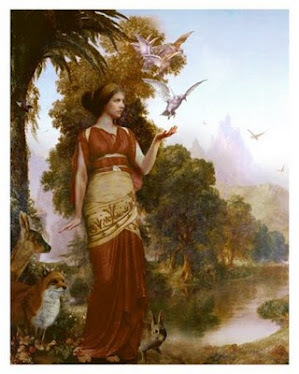 You turn and look again to the Goddess, and you see that she is ready to do what is necessary to serve those who have come; those who have found their way to her perfect fields. The Goddess beckons to you and as you move toward her, and the closer you get you feel that you are melding with her. As you come to her side, she smiles and embraces you and you feel yourself becoming one with her – becoming her! Your body is now her body, as hers is yours. Your ideas now take on a life of their own as the mind of the Goddess becomes your mind. You now know what to do. You are energized and can now organize and put forth the perfect way to serve those before you who are in such need. You move farther into the fields and begin to bend and pick the ripe vegetables. Your mind is so clear that you communicate silently to all present to move into a line in front of you, and as they do, you offer the first the food that you’ve harvested – all the while knowing that you are being guided by the Goddess herself. You can feel her energy inside and around you, smiling and joyous with this deed. As you offer the food, you realize that even the vegetables themselves are happy and radiating light. They feel fulfilled that they have a purpose and that their energy is not wasted – that they also have a practical use that serves. You continue to bend and pick, and feed the next in line and then the next. You are reaching out to each one not only with the food of your labors, but also with your mind. It is as though you understand the needs of each one and through making your offering of newly harvested food to them you also offer whatever it is that will make them whole. Your understanding of each other, your communication with each other, is complete. The work is hard but it exhilarates you. You are becoming stronger and more vibrant with each offering. Within the body of the Goddess you feel that you are now positively glowing with life force energy. Then as those who have eaten move from the line, you notice similar changes in them. They are more alive. They now wear smiles. Their eyes have begun to shine. And they are stronger too. They begin, one by one, to bend and pick the ripe food with you. They offer the others who have not yet eaten the same service that you have provided for them. Before long everyone present feeds another, until everyone has been served and made stronger, happier and more alive. As you are resting and breathing, happily lying in the fields with all the others, you have another realization. Each of these whom you have fed and served is a part of you! And with that realization comes another – every one, every animal, every being, every thing is a part of you. The ground, the Sun, the sky, the crops, the dew, the insects. You are all a part of each other and a part of the Goddess and a part of the Universe. To serve others is to serve yourself. To serve yourself is to serve others. As you stand now in this fresh awareness you understand that you have become the Goddess. Her body is yours. Her mind is yours. And then, beautifully, all present share this understanding. Each one comes to you and as you embrace them, they all meld with you just as you did with the Goddess. To serve others is to serve yourself. To serve yourself is to serve others. Now you are feeling refreshed and restored, regenerated in the power of the New Moon in Virgo. I have loved sharing this meditation with you. I hope on some level that your experience here will make a positive impact on your life and that it will help you get through the month more meaningfully and gracefully and creatively. And I really hope you don’t leave this as “shelf help” – meaning don’t just put it away and forget it’s impact. And I’m here to help you! Reach out for an Individual Consultation and we can explore this month’s energies within your personal birth chart – see where the New Moon requires growth for you – and then get you on track if that’s what you need! If you’re having challenges connecting or manifesting accomplishment, service toward others, or practical organization please email me at astrology@michellegregg.com! I’d love to help. We can get very specific to your needs in sessions that are one-to-one. So I’ll talk to you soon, and Happy New Moon in Virgo! Call 218.862.1300 and use code 122069 to join the call. 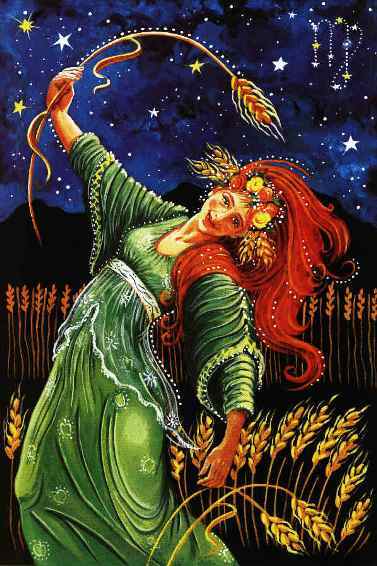 This New Moon occurs in the sign of Virgo, on Saturday, September 15, 2012 at 10:11 PM Eastern Daylight Time. And I look forward to talking with you on Saturday! 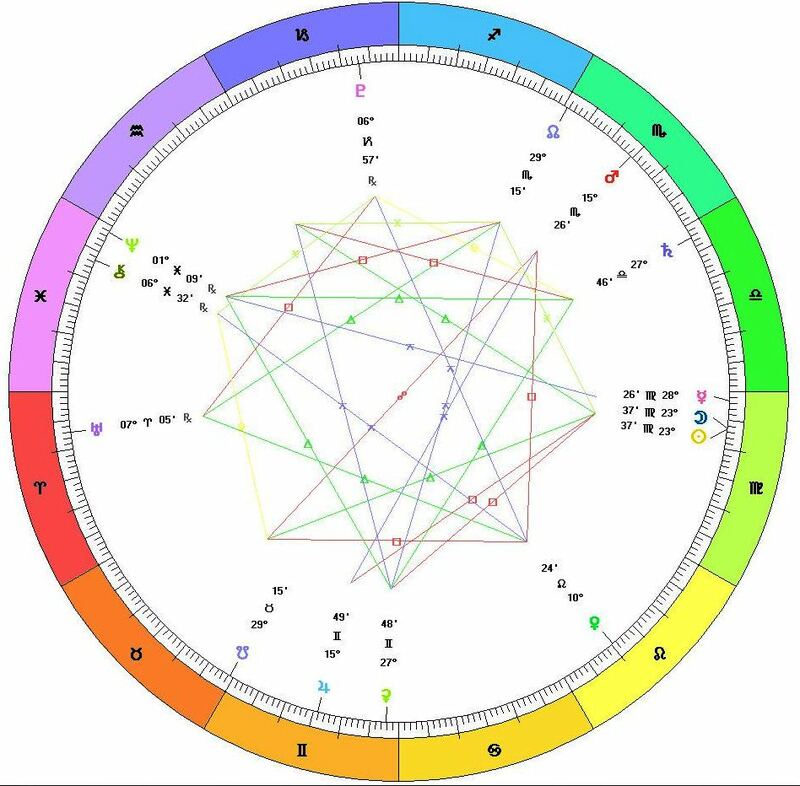 Here is the chart we’ll be using that is an Aries Wheel reflecting only the planets without a rising sign or houses – so no specific place specified. The chart is based on the natural wheel of the Zodiac beginning with Aries.